Bman's Blues Report: Working with a Publicist - Top Blues Music publicists give you the lowdown. Working with a Publicist - Top Blues Music publicists give you the lowdown. I work daily with a large number of top music publicists. A few of them were nice enough to take time out from their holiday break to provide this interview for us. The purpose of this interview is to provide an inside look at what role the publicist performs and what they do to help the artists build their business and to provide insight as to how this all works. It may also be interesting for the average listener/reader to see what their favorite artist has to go through to get things off of the ground! But we're going to put our own twist on "Boxing Day". Boxing Day is traditionally a day following Christmas when wealthy people in the United Kingdom would give a box containing a gift to their servants. Today, Boxing Day is better known as a bank or public holiday that occurs on December 26, or the first or second weekday after Christmas Day, depending on national or regional laws. It is observed in Great Britain, Australia, Canada, New Zealand, and some other Commonwealth nations. We are going to relate Boxing Day to the greatest self promoter of all time ... and not a bad boxer either! 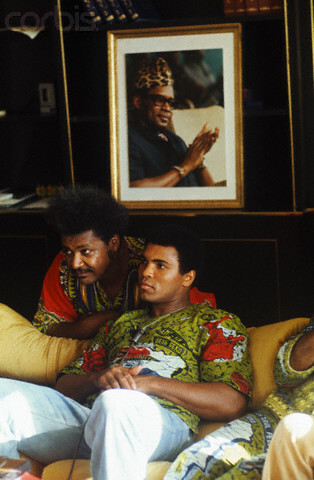 Cassius Clay AKA Muhammad Ali and his promoter...Don King. Don teed up everything for Ali but Ali was ready to rap it out of the ring... and could easily been the best publicist of all time... at least he knew how to draw attention! President of Conqueroo, a Los Angeles music publicity company - http://www.conqueroo.com. Current clients include: Real Blues Festival of Orange County; Northern California Blues Festival; Papa J and Friends; Alastair Greene; Howard and the White Boys; Head Honchos'; Richie Onori; Dave Widow and the Lineup; Big Shot Reub and the Reloaders; Scorch Sisters; King Hat Review; K.K. Martin; Jay Gordon and the Penetrators; Jeffrey Halford and the Healers; Eileen Carey; Natasha James; Pete Thelen; Feisty Piranhas; Headroom; Whiskey Dawn; Winchester Rebels; Sonja Dunson; Electric Shepherd; Ellee Ven/Hot Sauce Records; John Enghauser; David Lynch; Michael Z. Cummings; LeReverie, Astral Kitchen and Randell K.
Bman: First I want to thank all of you for your time during this busy time of the year. Why does an artist need a publicist? Frank: First let me say that not every artist needs a publicist, however every artist needs publicity. Bman: I guess that's one of the voids that I fill. In my quest to find music and artists that I find interesting, and sharing my journey with my readers, my hope is that I provide the artists exposure to other music enthusiasts as well as the media and publicists. Not everyone is Muhammad Ali! Bman: So an artist thinks they may be ready to take that next step and they really aren't Muhammed Ali. Doug: We (publicists) are the lifeline and vital link to the media at-large, be it magazines, newspapers, radio, television or online entities. We create the press information and then send it to the various media, subsequently following up on it to completion - usually resulting in some form of coverage and exposure for a client. Sarah: Artists need a publicist for many reasons. Obviously They need us for our contacts and relationships in the media and taste makers, but they also need a publicist to help with career advice, motivation, finding managers, finding and working with booking agents, promote tours, manage social media, manage the artists ‘brand’…. And lots more! Frank: Certain artists that are at a level where they have some recognition already, perhaps through their own efforts by performances, recordings, attending events, perhaps some advertising etc., but now need the efforts of a publicist in order to help them attain wider exposure. Bring them to the forefront of a larger audience. If its a recording artist then we would achieve this by securing National and International airplay on the radio; magazine and internet write ups; music and cd reviews; arrange interviews as well as specialty shows and television appearances. The more opportunities for exposure the merrier. Bman: How exactly does an artist select a publicist or does a publicist select an artist? Cary: Research various publicity companies online. You can learn a lot about the way they present themselves via their web site. Are the written materials strong and persuasive? If so, it’s very likely they’ll represent the artist that way.Then send a link to the music. See if a) that publicist has interest in the music, and b) whether they have the space on their roster for the next three months. If the answer to either question is no, go on to the next company. Sarah: Research and word of mouth. I never work with an artist that I would not listen to normally. Artists have chosen to work with me based on word of mouth and recommendations from other artists and industry folk. Also, selecting a publicist who works with artists that are similar would be a good idea.. An artist would benefit from someone who has worked and had success with similar bands. Frank: The artists that I have the pleasure to represent chose me. I would think that it is most likely based on the publicists credentials in a specific field, like music for example or in my case specific to Blues. I spent several years doing publicity for a couple of blues record companies. This is where I developed my relationships with the respected media, press & radio prior to opening Roszak Promotions. Doug: Speaking strictly from my own experience, many of my clients have come as a result of referrals - either by people in the music business, or current clients recommending me to new ones. Many times, a publicist will see a band or solo artist and assess them as a good fit for his/her pr services; or vice versa. A band or solo artist might hear that "such-and-such" publicist specializes in the genre of music they play, and will seek out said publicist to promote them for that reason. Bman: How does an artist know when it is time to contract with a publicist? I think that you are all right on. Ali chose Don King and although successful, possibly not the best choice! Sarah: When the DYI method no longer yields results. When the artist’s creativity is compromised from trying to do it all themselves. When a new CD releases and tours are coming up. Doug: The most obvious times for this to happen is when a band or solo artist is either going on tour; has released a new album; (or) is in need of publicity for a special cause or event. It's generally a wise idea to retain a publicist from the start to get the "buzz" going on a band or solo artist, period. I am working with guitarist, producer, writer and recording artist Pete Anderson. Pete has been in the forefront of the music business for just about all his life. He spent 25 years along side Dwight Yokam, producing, writing and playing on all of Dwights records and tours. Pete hired me back in April of 2011 to handle all his Radio Promotion for his "Even Things Up" Tour 2011. Basically my responsibilities were to support Pete's appearances in every city that he played by securing "in studio" performances, interviews and airplay . This would certainly warrant a publicist. Tour support is one of the most vital aspects of a successful tour for an artist. I also supplied tour support this past summer for Ruf Records "Blues Caravan Tour" featuring 3 of the most talented young ladies (Guitarist) in the industry today (Cassie Taylor, Samantha Fish and Dani Wilde). I followed them from city to city providing them with interview opportunities with radio and press. They also did a television show in CT, in support of a concert there. These are only a few of the reasons for contacting a publicist. I also provide both established and upcoming artists with the ability to be heard on radio and read about. I provide radio promotion and marketing for artists whose primary need is to get their CD heard and reviewed by the media. Bman: Why would one publicist be better than another for a particular artist? Sarah: We are all different and have different strengths and weaknesses. It all depends on the needs of the artist. Sometimes budget can be an issue for artists, but finding a publicist who is flexible or offers different packages can be helpful. Doug: You probably wouldn't want to hire a publicist who primarily works in, say, the hip-hop/rap genre to work a new album release by a traditional folk artist - mainly, because a publicist who primarily works hip-hop music more than likely doesn't have great contacts in the folk music genre. Which is not to say that the hip-hop publicist couldn't handle the folk artist's publicity - just that the better idea is to go with a publicist who is well-versed in the music genre that the band or solo artist performs. Bman: That makes perfect sense. What exactly should an artist expect from a publicist? Ali could promote anything! I mean George Foreman became a millionaire selling hamburger grills! Cary: Targeted media should be clarified before the publicist begins. Publicity people should listen to the artists’ media ambitions. And artists should trust their people in the PR trenches as they work the media every day.. Everybody wants to be on NPR and late-night TV, but artists require a certain amount of pre-existing sizzle before this is the case. Barring these “holy grail” targets, a best-case scenario would include reviews and features in a smattering of print magazines, newspapers, online ‘zines and blogs. And no reason simply to limit it to reviews: YouTube and mp3 placements also count as publicity and in many ways drive music sales more than CDs. Tour publicity is also paramount as it can make a significant difference when an artist pulls into a tour city. Sarah: Results, respect, 100% effort. A publicist will champion the artist’s career through media contacts and through word of mouth to music fans. We ensure facts are correct in interviews and blogs. Help with writing bios, career advice, personal advice at times. Team work. Frank: To secure as much visibility as possible for a particular artist, whether it be through radio, press, internet and television. There are various levels of expectancy here all depending on the artist and who he or she is. And to update the artists as often as possible. The key here is communication. Bman: We actually appreciate that Doug! But seriously, how does a publicist work with the media? Sarah: Working with the media is a great joy for me! We work with media by sending press releases, calling our contacts to let them know relevant news and upcoming tour dates or CD releases. We constantly present our clients music to radio programmers. We ensure that the most relevant contacts like you get the releases. A publicist needs to be up-to-date with social media techniques and use it to keep spreading the word about the artist. Frank: I work with many different forms of media .My services range from securing radio play around the world to working with many different print publications which vary from magazines and newspapers, to the electronic world (Digital/Internet) e mail blasts, blogs and websites. I particularly enjoy working with what I see as the total future for all forms of publicity, the Internet. The ability to connect with a much wider audience in a relatively short period of time. I really rely a lot on blogs and websites such as your own Bman's Blues Report. Its all about people and connecting with people. Helping spread the word about personal discoveries and sharing them with their followers. This is how I find out about what might be happening. I subscribe to all related Blogs so I can track the latest news and or artist. Doug: For one, pitching good story ideas that involve the client he/she is representing; and building solid long-term relationships (i.e. for a publicist promoting blues music, there is no better friend in the business than Bman - he has been incredibly supportive of independent acts, something that is harder and harder to find these days). We need each other, but from my point of view, we (publicists) need the media more than vice versa. My mantra is to always treat every media person at any level with courtesy and respect. Bman: I appreciate those comments. You know that I love what I do and sincerely try to help everyone get the exposure that they deserve. Nothing gets me pumped up more than finding something cool and telling everyone who will listen what I have found! Any advice for upcoming artists? Sarah: Artists need to manage their own expectations of what a publicist can do for you. Be realistic about knowing where you are in your career when a publicist starts working with you. Keep on doing what you do best – making music, and let us handle the rest. Working with a publicist or manager is a team effort. We are all here for the same reason . We believe in the artist and love the music. Frank: Never hesitate to contact a publicist. It maybe your time to shine. Even if its not the time yet, find out how they can be of help in the future. Doug: First and foremost, this is the Music BUSINESS. It should always be viewed as such. Virtually any decision a band or solo artist makes (i.e. who you hire to work with; shows you play; the price of the CD you print up to be released; the producer you hire to record your album, etc.) should always be done with the bottom line in mind. Also know that you will have to work as hard - probably harder - to succeed in the music business than you would in virtually any other business. Create a solid long-term game plan and work it! Bman: I hope that everyone enjoyed my mixing one of my passions, boxing, with the music industry. Not everyone is Muhammad Ali. Not everyone has his talents and not everyone has his charisma. Work with the media. Whether it be your friendly blogger or your publicist, everyone needs the exposure. Once again I appreciate all of you taking time out from your holiday time to talk with me. Happy Holidays and best of luck for a great year in the entertainment industry!! Great article BMan and one would think, a "must" for all aspiring bands and solo artists to read (not to mention those who book and manage said acts). Thanks BMan's blues Report!!! Here are some other links that may be of interest! This post is a real contribution to blues musicians who are looking toward enhancing their career. Thanks for putting it together. And, hey, I like Ali too! Thanks Tom! I'm trying to provide a place where talented musicians can get a forum and I have a good number of "official" ears. I spend my time looking for great music because I like to. It is very gratifying when I can help other musicians. I appreciate your comments. Thanks for sharing..regards and have a good one!